There is still construction work to complete on the Gold Line Foothill Extension project, but still some welcome news — train testing on portions of the track will soon be beginning. 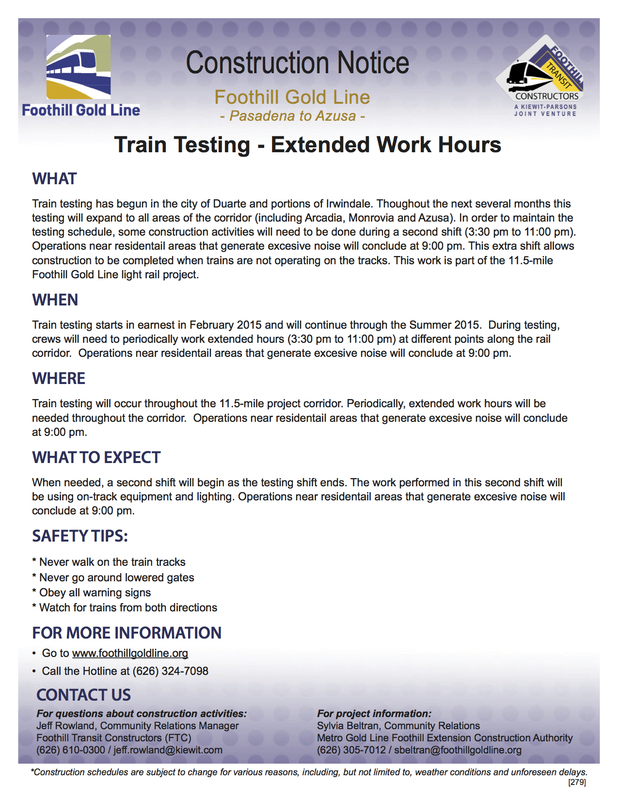 The notice from the Gold Line Foothill Extension Construction Authority is below. As for those who live and work in the area — please be safe around the train tracks! The Foothill Extension will extend the Gold Line 11.5 miles from eastern Pasadena to the Azusa/Glendora border and include six new stations in Arcadia, Monrovia, Duarte, Irwindale, downtown Azusa and Azusa/Citrus College. The project is largely funded by the Measure R sales tax increase approved by Los Angeles County voters in 2008 and is scheduled to open in the first half of 2016. Foothill Extension poll results: why will you ride, where will you ride? There is no wire up east of Irwindale yet. How is this going to happen by then?